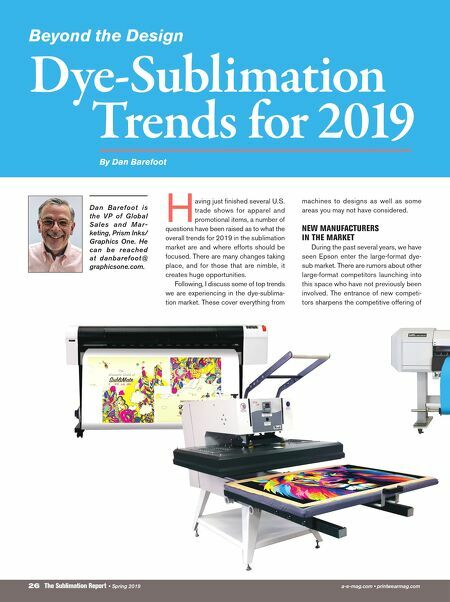 26 The Sublimation Report • Spring 2019 a-e-mag.com • printwearmag.com H aving just finished several U.S. trade shows for apparel and promotional items, a number of questions have been raised as to what the overall trends for 2019 in the sublimation market are and where efforts should be focused. There are many changes taking place, and for those that are nimble, it creates huge opportunities. Following, I discuss some of top trends we are experiencing in the dye-sublima- tion market. These cover everything from machines to designs as well as some areas you may not have considered. NEW MANUFACTURERS IN THE MARKET During the past several years, we have seen Epson enter the large-format dye- sub market. There are rumors about other large-format competitors launching into this space who have not previously been involved. 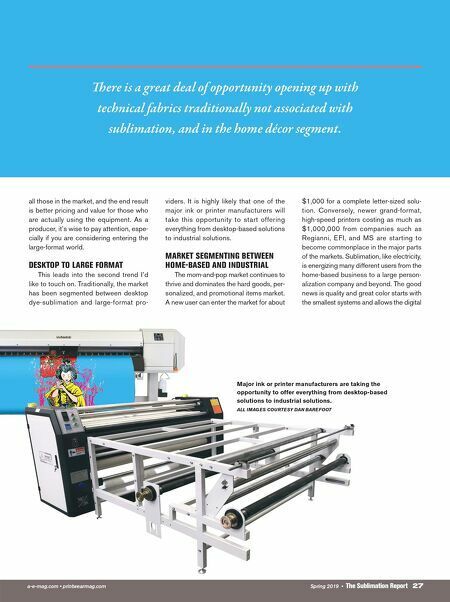 The entrance of new competi- tors sharpens the competitive offering of Dye-Sublimation Trends for 2019 By Dan Barefoot Beyond the Design Dan Barefoot is the V P of Global Sales and Mar- keting, Prism Inks/ Graphics One. He can be reached at danbarefoot@ graphicsone.com.